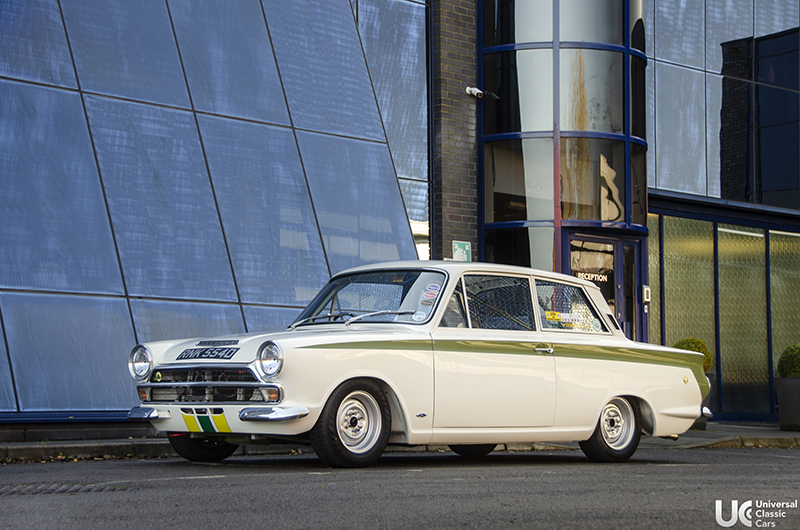 The original mk1 Lotus Cortina, named the ‘Consul Cortina developed by Lotus’, was developed between 1963 and 1970 to celebrate Ford’s new partnership with Lotus. Colin Chapman built his own twin-cam version of Ford’s Kent engine, which was destined for Ford’s Group 2 homologation Cortinas. Ford supplied the Cortina bodyshells and focused on the sales of the road cars, whilst Colin and Lotus developed the mechanical side of the car and cosmetically changed the visuals. This resulted in a radically more capable and track-focused car using the Lotus Elan’s close-ratio gearbox, with 105bhp resulting from the 1577cc engine. The Lotus’ bonnet, doors and boot used lightweight alloy panels and new Lotus badges and a green stripe were added to the bodies on top of the painted-white surface. Additional suspension upgrades included shorter front struts, forged track control arms and radical vertical coil dampers replacing the original leaf springs. All these changes and more gave the car an overall better weight distribution. 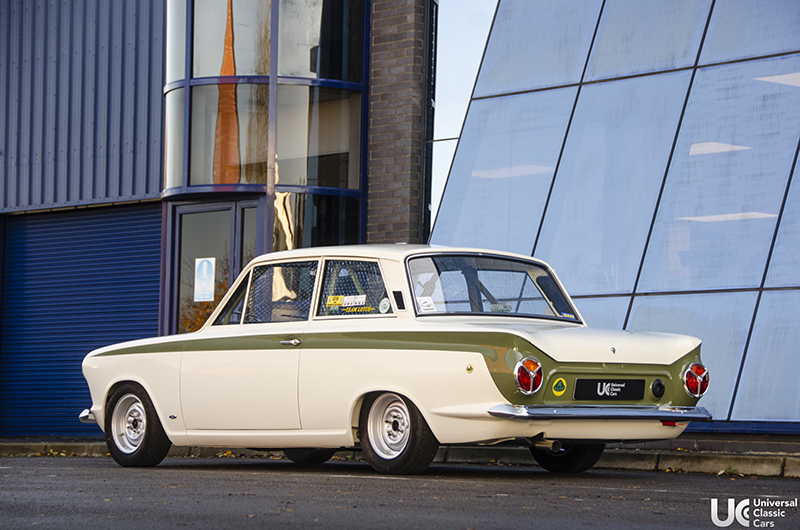 The correct-numbers 1966 mk1 Lotus Cortina you see here has been quoted by Retro Ford magazine as ‘the best mk1 Lotus Cortina there’s ever been’, and it is easy to see why. 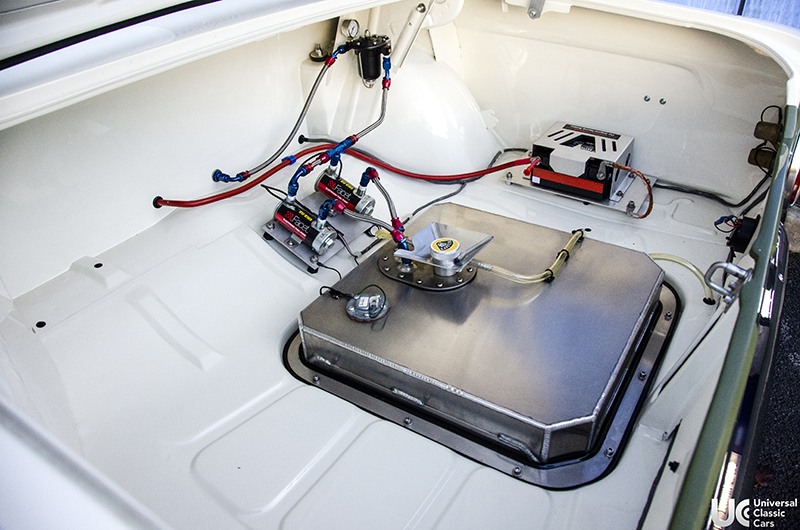 The car has undergone an enormously extensive 2-year, bare-metal restoration by Jon Paul Motor Services, where no bolt and no panel has gone untouched. Every hidden aspect is in as good condition as visible parts of the car, and panel gaps have been adjusted to be near millimetre-perfect. As well as the multi-point rollcage and BRM rocker cover, the lesser-seen gearbox casing and Quafe-stuffed axle have been matched to the Sherwood Green colour of the side-stripes. Other benefits include an aluminium bonnet, boot and doors fitted by CL Panelcraft. In addition to the visually-perfect restoration the car has received an Appendix K spec upgrade, originally preparing it for the potential of FIA competition usage, supplementing period-modified performance parts. The original twin-cam engine was sent to CTM Performance Engineering and it now features race cams, a steel crank, steel rods, forged pistons, a high-pressure oil pump, three-angle valve seats with big valves. All this is mated to beautiful twin-45 Webers. The power output, originally dyno’d at 180bhp, is handled by straight-cut Quaife gears with a 4.4 English LSD. 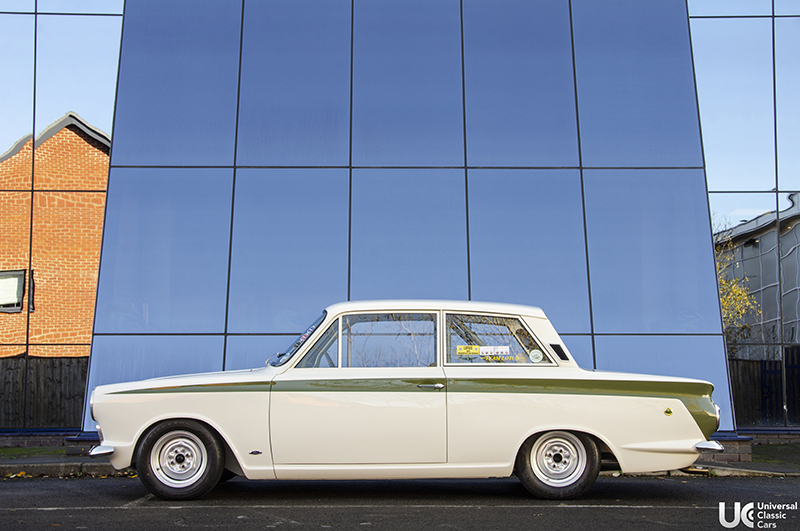 The interior is expectantly equal to the Cortina’s exterior presence. 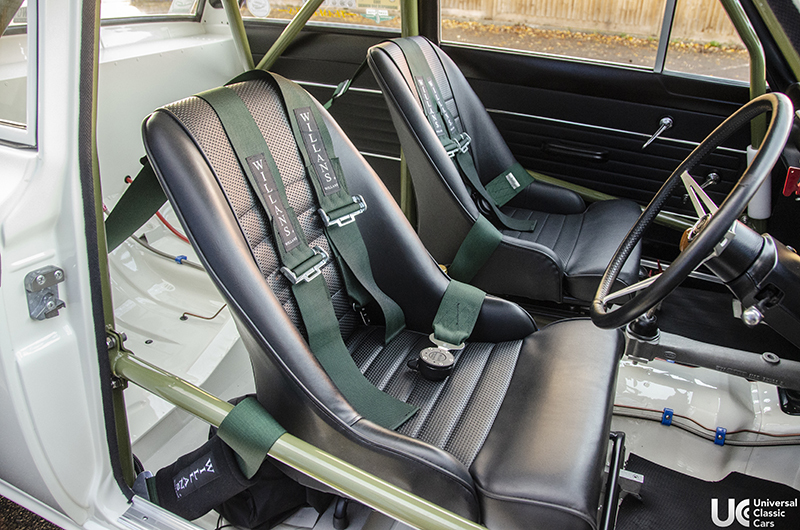 As you are surrounded by the exposed painted Ermine White shell, the leather steering wheel, rollcage, Contour race seats, Willans harnesses and new Smiths gauges combine to generate just the same race-retro sensation as the visual specification of the rest of the car. Further additions include a custom fuse/relay board hidden within the glovebox. Under the bonnet and in the boot are no different. In the rear you’ll see an exposed foam-filled fuel cell with its two Red-Top fuel pumps matching its Varley Red-Top race battery. 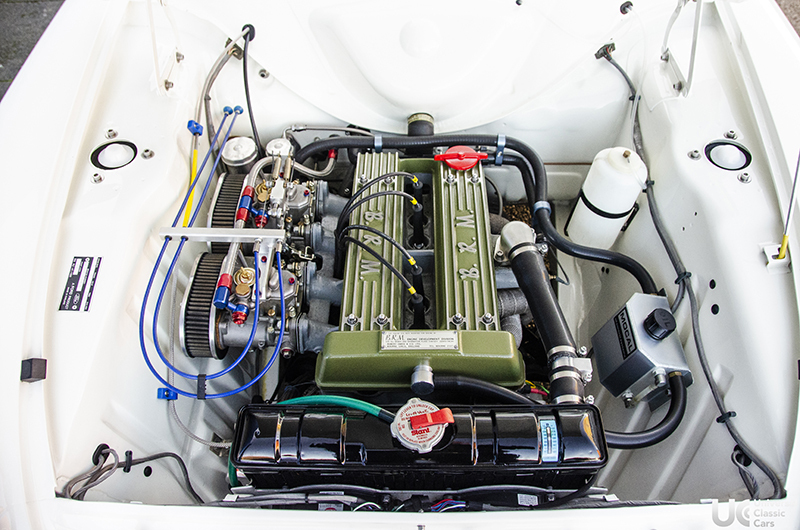 Up front you are greeted by its flawless BRM finned rocker cover, the polished twin-45s, heat-wrapped steel manifold and Aeroquip hoses to name a few. To match is an immaculate underbelly featuring a bespoke stainless-steel Hayward & Scott exhaust system. Beneficially, all the car’s original pre-upgrade parts and interior have been retained so that anyone can return it to as-new condition if they desire. The car includes a comprehensive history package, including its original handbook and original logbook, as well as a large collection of photographs detailing its restoration process. Also present are magazines featuring front-page articles of the car in addition to the extensively detailed Servicing and MOT history that you would expect. It has undergone 1893 miles since its recent restoration and has remained in family ownership since then. This car has been fortunate enough to have been used in competition in conjunction with having been consistently maintained in pristine condition, thus keeping to the immaculacy that its restoration provided.